Google and other search engines are constantly working to provide searchers with the most relevant and useful information available. One way they do this is by prioritizing locally relevant results. For businesses, maximizing your local search rankings can make a significant and immediate impact on your bottom line. This post covers the basics of local SEO, key tips for improving your local search rank, and some of the challenges you may face along the way. Let’s jump in. Search engines use location as one of the key factors when ranking the most relevant search results. So, if you’re in Chicago and you search for a pizza place, your search results will be totally different to someone conducting the same search in New York City. Due to the increasingly localized nature of search results, it’s important that your content sends the right signals to search engines and human users to let them know that your website is relevant to them within their specific geographic area. According to Google, 46% of all online searches performed and nearly one-third of all mobile searches are related to location. The most common query is to find information about a specific business like a company address or phone number. The shift to localized search results makes it essential for marketers today to focus on creating more local content. It’s not enough to simply sprinkle a few local keywords on your homepage. To make a real difference to your search engine rankings, you need to build pages based on each specific location relevant to your business. You can do this by incorporating descriptive keywords about your town, city and state into content pieces that are relevant to your target audience. 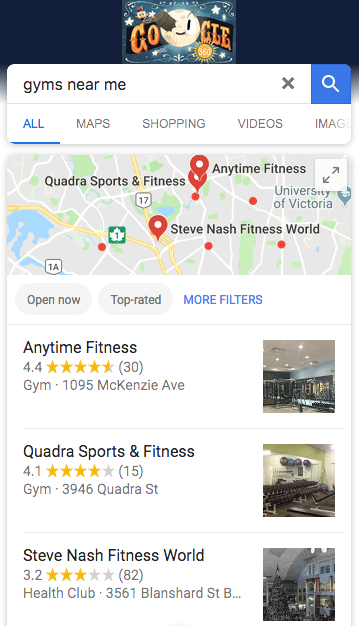 Google’s local pack now appears for local searches with a map and three local business listings. This local pack appears for at least 93% of searches with local intent, so it’s an incredibly powerful piece of “free advertising” if you can make it onto this list. As an example, if you search for “painting classes nyc,” the top-rated painting school in New York — The Art Studio NY — ranks number one in the local pack. The listing includes the name, address and phone number (NAP), a Google Map, Google Reviews, hours, a website link and directions. By focusing on local SEO, businesses with locations scattered around the country can dramatically increase their online exposure. Unlike broad-reach SEO, which is highly competitive, local SEO can quickly generate quality leads. This also means a difference in keyword strategy. For example, a national insurance company might want to rank for the term “cheap life insurance.” However, a local insurance firm that mainly serves local residents would want to rank for “Springfield insurance company,” or whichever location is relevant. Location-based keyphrases and local content also have less competition. If you’re a small to medium-sized business, competing against larger organizations for search engine prominence is out of the question. To reach more customers, you need to optimize your content for a local audience. 30 percent of those searches result in a purchase. 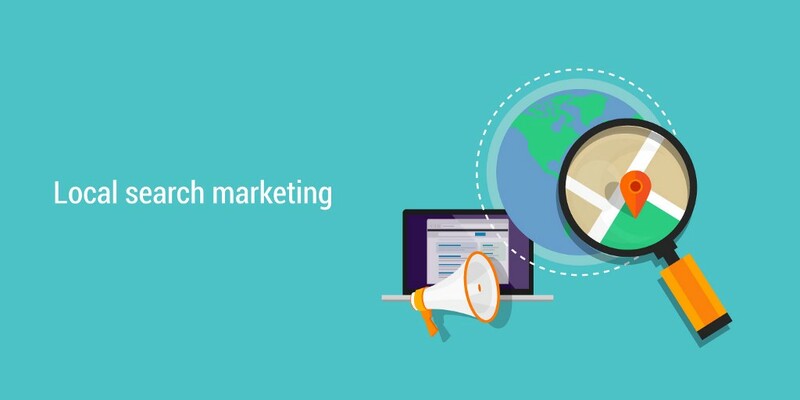 To ensure people find your business, you need to use content marketing and local SEO techniques to increase your website’s local rankings. So where do you begin? First, you need to make sure Google and other search engines know you’re a credible business and understand what you offer. Optimize your title tags, headers, meta descriptions, and images with relevant local keywords. Optimize your content (more on this later). Make sure the NAP (name, address, and phone number) information is consistent across your website. Improve your website’s internal linking structure. This supports website navigation and the ranking power of your web pages. Get your business listed on Google My Business and make sure your profile is complete. When categorizing your business, stick to the relevant ones that specifically describe your business. Also, remember to upload photos to your listing and use images that instantly show users what your business is all about. Local keywords in your business description. Your main products and services and acceptable payment methods. Using the right keywords in web content and blog posts is crucial for local SEO. Use a tool like Google Keyword Planner to search for keywords relevant to your business. Go for ones that have high search volumes and low competition. Find out more in our post: Keyword Optimization and How to Target the Right Search Terms. Also check out the Google Ads help page. If you have more than one store, create separate location pages. These can include unique store descriptions, hours of operation, parking info, testimonials, news, and offers. Avoid duplicating content across multiple location pages. Post more local content on social media and include local keywords in your profiles. Search engines use social media indicators like shares and links to determine the relevancy of a business. Behind-the-scenes details of your business. 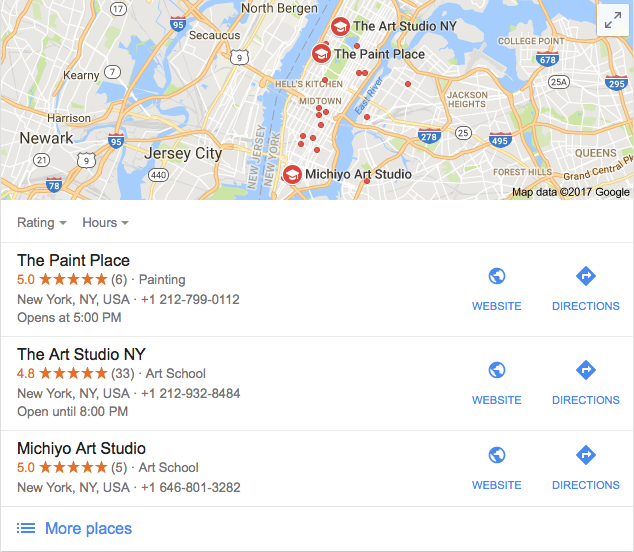 In our previous example, The Art Studio NY uses many customer reviews throughout its site to boost their local SEO. Google seems to favor businesses with stronger reviews. Include local keywords in your account profiles and descriptions. Ensure your NAP information is consistent across sites. Include links to your website in your “About” section. For more social media tips, visit our guide: How to Build a Social Media Content Strategy. According to a recent study, 57 percent of all U.S. online traffic now comes from smartphones and tablets2. Given that nine out of ten smartphone users conduct local searches3, your website needs to be mobile-friendly if you want to remain competitive. To find out more, read our post: Essentials to Make Your Content Mobile. Volunteer time for a local initiative. Donate your business space to a local group. Be a guest speaker at a local school. Conduct a local study by asking people questions about your industry and publish the results. Or pull together a list of statistics focused on your area of business. This gives other businesses and bloggers the opportunity to reference and link to your content. Need help creating linkable content assets? We can help. A recent Google survey revealed that four out of five people used search engines to find out local information such as business hours, directions, and product availability. For companies with multiple store locations and location-specific details to deal with, it can be difficult to keep all the information up to date. You have to make sure local business names, addresses, phone numbers, and opening hours are accurate, there are also the various deals, images, website URLs, and information about products and services to keep up to date. The problems of data management have been compounded by multiple online marketing opportunities. With Google+, Yelp, Foursquare, Facebook, and more platforms offering various opportunities for brand promotion, there needs to be a reliable system in place to make sure details are consistent across every platform. If there are any inconsistencies, they’ll be picked up by Google, and this could seriously impact search rankings. For long-term local SEO success, these strategies should be a core part of your marketing activities. If you schedule some time and follow these steps, you’ll steadily build brand awareness, reach more local customers with your content, and gain the competitive advantage. Is it time for your brand to focus more on local SEO? Local SEO: How To Increase Your Local Search Rank was originally published in Marketing And Growth Hacking on Medium, where people are continuing the conversation by highlighting and responding to this story.